How did I end up with Roger E. Moore's magazines? I'm not sure if Roger E. Moore sticks out to me from among all the Dragon writers in my early years with D&D because 1) he wrote the articles that meant the most to me, 2) he was one of the most prevalent contributors to the mag, or 3) I liked (Sir) Roger Moore so much in Live and Let Die that anybody with the same name must be pretty cool. There's also a nice overview of Moore's Astral Plane article from a few weeks back at Grognardia. 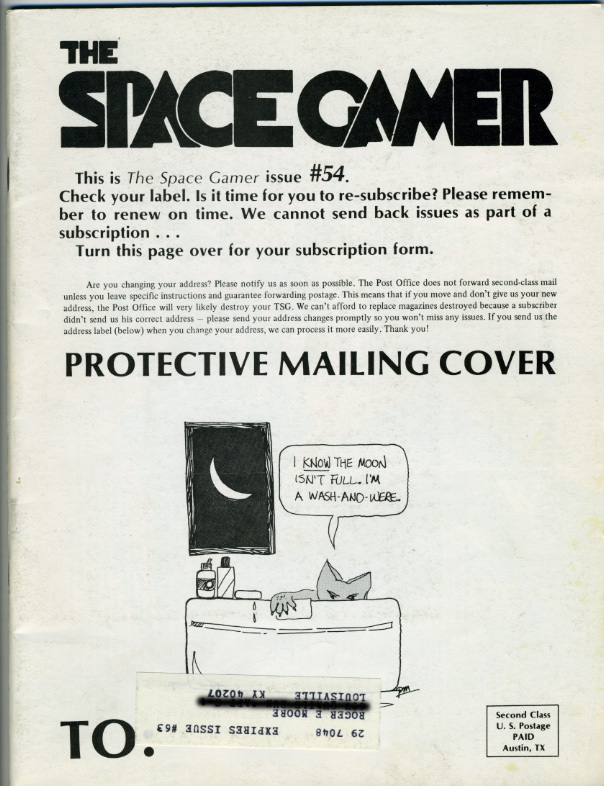 So imagine my surprise when (not having thoroughly checked my "new" old issues of The Space Gamer at the store) I got my "new" old issues of The Space Gamer home to find that the stickers on the "protective mailing covers" had the issues addressed to one "Roger E. Moore" of Kentucky. So how did they get from Louisville, Kentucky to Rockwall, Texas? Hmm. Space Gamer 47: Special D&D Issue? A new indie used book store has popped up on my radar and I seem to have hit the mother lode yesterday. While I'm just finding the store, it seems to have been tucked away for some time, which means a lot of its gaming materials are older. Long story short, I scored a slew of Space Gamer and Ares magazines from 1980-82 including Space Gamer 47, a "Special D&D Issue." 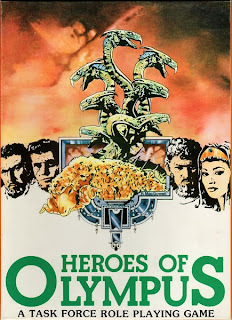 The article of particular interest to me from this issue was the article by Aaron Allston and Ronald Pehr entitled Remedial Roleplaying, described in the TOC as "Getting more out of role-playing than just bashing monsters." 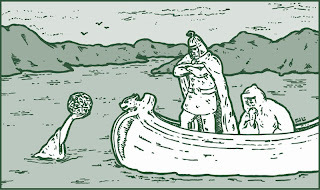 The article launches by presenting a scenario in which 20th level lawful good characters plot the downfall of innocent merchants and 1st level guards, then pointing out the circular process rooted in original D&D... "To become a better and richer character, you must get experience points; to get experience points, you must kill things; the more things you kill, the better you will be able to kill things. Oboy!" In January of 1982, that's probably how most of us were still playing. I know I was. 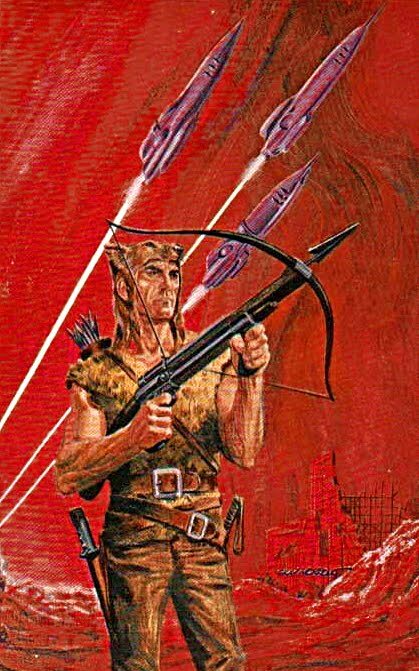 In fact, I commented just last night to my co-conspirator David Welborn that my high school gaming group was guilty of devolving into a weekly death duel using whatever newest ruleset someone had brought to the (gaming) table. Granted, we played a LOT of supers games (Champions, V&V, MSH) so that may have something to do with our mindset, but even my weekend D&D campaigns with friends weren't really campaigns at all, being nothing more than one-off dungeon crawls. Now here we are just about 31 years later, to the issue date, and we're now all very familiar (from our own collective experiences) with the precepts put forward in Mssrs. Allston and Pehr's article (and I'm paraphrasing here): 1) a world exists above ground where every locale and NPC should be unique, 2) encounters should have rationales that extend beyond the walls of the dungeon, 3) keep treasure low and prices high to force the effects of economics on the characters, 4) use background/social status to influence gameplay (see "WELL-ROUNDED RPGs" below), 5) secrecy = paranoia and conflict, 6) talents = more interesting characters (again, see "WELL-ROUNDED RPGs" below), and 7) "This is Your World!" I think one of the most interesting facets of the article is it's D&D-centric view (rightly so, given the issue of the mag is a "Special D&D Issue,") while referencing other systems (particularly C&S, TFT, and RQ) in regards to adapting their systems for social status and talents to D&D. When you compare D&D (of the time) to many other games that encourage the role-playing (sometimes even more so than the fighting), D&D begins to appear uniquely one-dimensional. In En Garde!, social climbing is de rigueur. Chivalry & Sorcery not only wraps social status into every character, but also provides a set of fears and phobias to add character depth. If you look at the 1e D&D DM guide, as broad as the content seems to be at first glance, it's all about setting (climate/ecology, government forms, inhabitants, tariffs/taxes/tolls, monster population and placement, et al.) 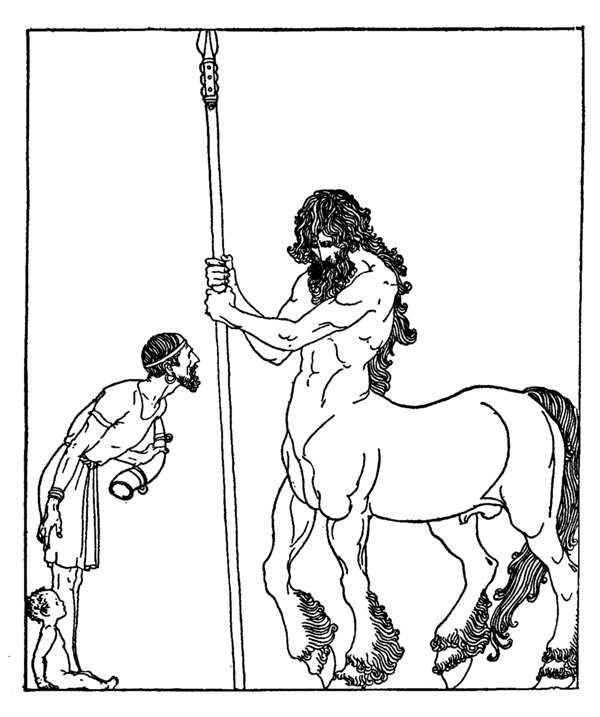 and offers little beyond the goal of "populating the world with monsters and magic shops." 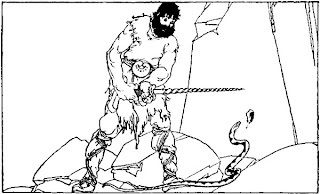 Granted, there are some secondary skills and social status information in there, but I think this sentence best sums up the attitude of D&D as a hack'n slash game over true role-playing... "When secondary skills are used, it is up to the DM to create and/or adjudicate situations in which these skills are used or useful to the player character." 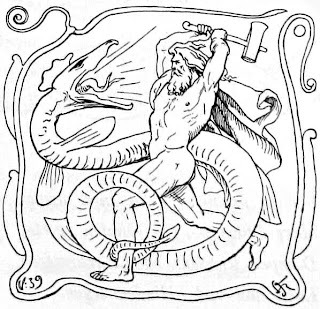 The example that then follows is how an individual with the armorer skill could tell the quality of a piece of armor, or a repair. How dry is that? 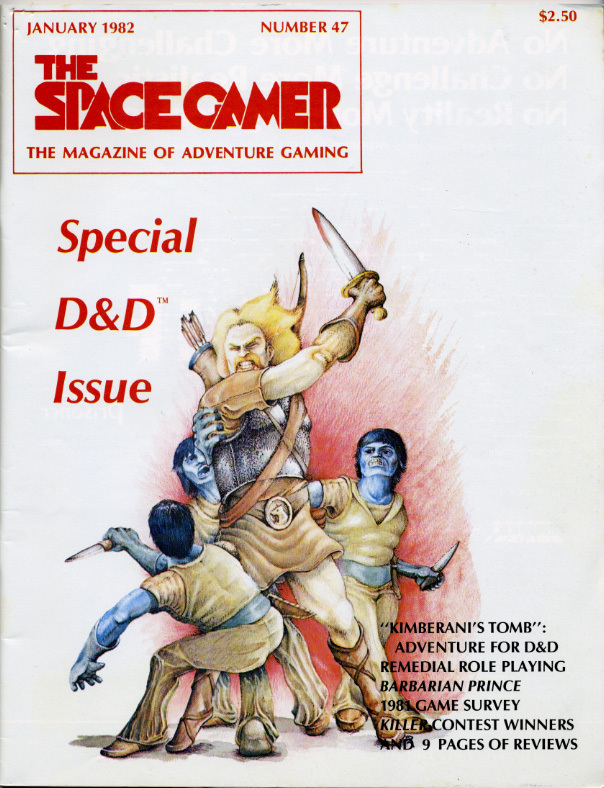 ALSO IN THIS "SPECIAL D&D ISSUE"! Is that what makes a "Special D&D Issue?" 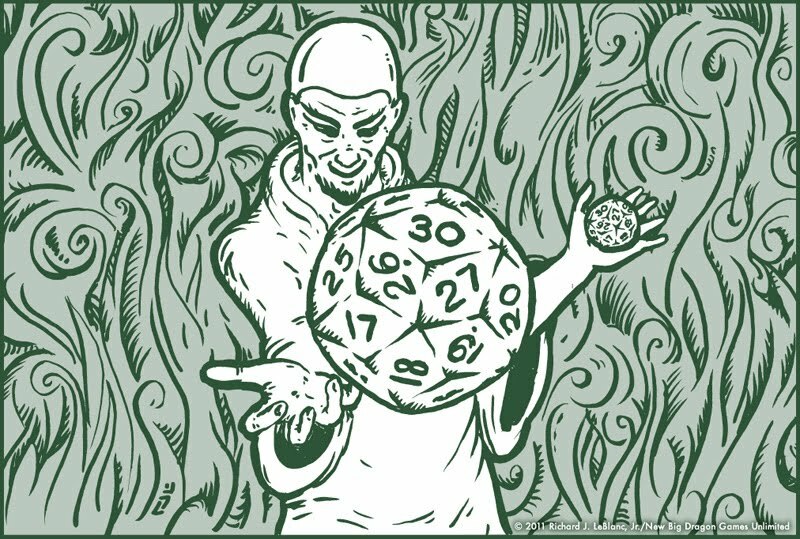 A fairly generic GM article that references the flaws in D&D and a leftover module from Texcon, a convention held in Austin (home of SJG.) Hmmm? 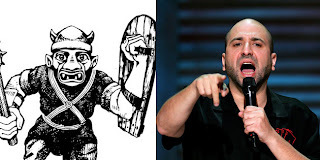 Do I smell a conspiracy? This is the back cover image from the module I've been working on. As I've edited the module to be BX/LL specific, I've changed the "OE1" module number to "SK1" (a reference to a name within the storyline.) Also, as if you couldn't tell, there's a cult involved. Among my recently unearthed gaming items from 1981/2 was this incomplete drawing of some... beast (I think I was trying to cross a mind flayer and an umber hulk?) I've gone ahead and redrawn it (this time, to fruition) and the fruits of that labor appear below. 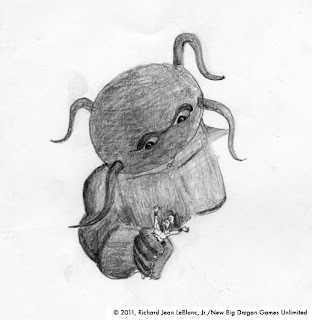 Both imges ©2011, Richard Jean LeBlanc, Jr./New Big Dragon Games Unlimited. The reproduction or re-purposing of these images is strictly forbidden except by direct permission by the copyright holder. These images are NOT CREATIVE COMMONS! Ahem... that's "Eisner Award Winner Bill Willingham" to you. 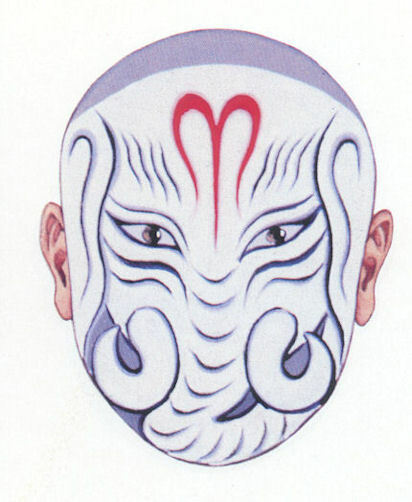 Bill's work epitomized "the Moldvay era" to me, from the dungeon party fighting the dragon in the '81 red book, to the picture of the phanatons attacking that dude on the title page of X1. 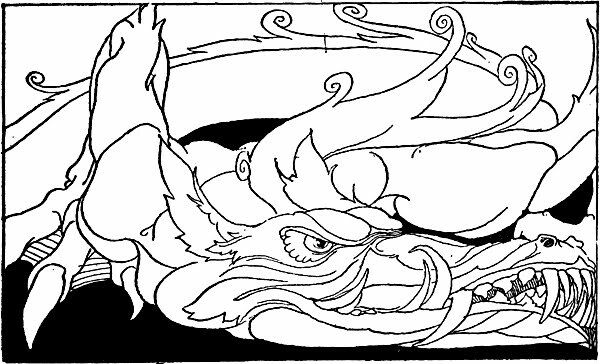 These days, Bill's as much of a writer as an artist, but if you grognards are feeling nostalgic, Jeff over at Jeff's Gameblog has put together a nice mini-gallery of Bill's D&D stuff. I can hear it now... the collective, "WHO?!" out there in the blogosphere. And rightly so, as MacGowan is an oddity on this list (and the previous list) for a couple of reasons: 1) while he did illustrate many of the games he worked on, MacGowan is better know as an Art Director/Designer, and 2) art director types don't usually get too much credit, even when they're as prolific as MacGowan--his art and design graced the covers and interiors of an unmatched list of wargames that number around 300 and include the likes of Avalon Hill's Squad Leader and PanzerKrieg, as well as Yaquinto's Swashbuckler. 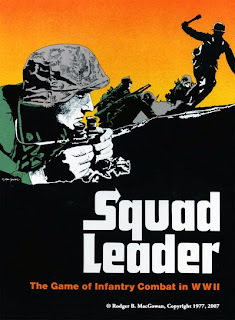 To me, MacGowan's style, particularly his use of high contrast photo-imagery as well as illustrations that mimic that look, defines wargame graphics of the late 1970s/early 1980s. Moreover, as the art director/designer of the work (a luxury most freelance illustrators don't have), he really created a "look" more so than just creating "art" for the games he worked on. MacGowan is now the editor-in-chief of C3i magazine, where you can find a more complete profile of RBM himself. 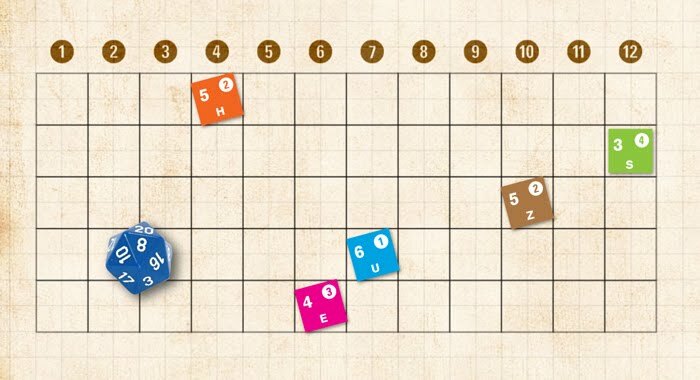 This week's d30 Feature was originally going to be in the d30 DM Companion until I realized the companion had more of a dungeon bent, and this chart felt more "outdoor/wilderness." 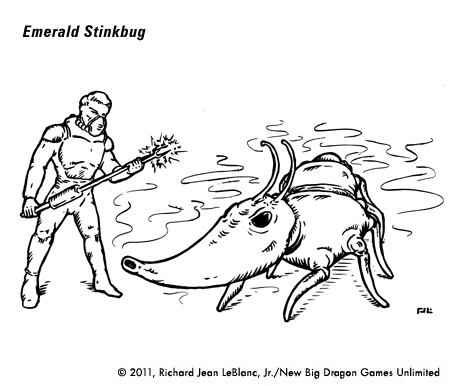 Consider this a preview for the d30 Wilderness Companion, should it ever exist. Every once in a while, I dig something out of my files (sometimes paper, sometimes digital), and think to myself, "What was I thinking?" No, really. I don't know what the thought was, and I'm incapable of reverse engineering my own idea. Such is the case with the chart at the left. In this case, I do know a couple of things: 1) it was while I was working on the anime RPG concept that developed into StoryCode AG, and 2) it used the tri-color d3s from the game Toss Up, purchased on sale at Wal-Mart a while back. 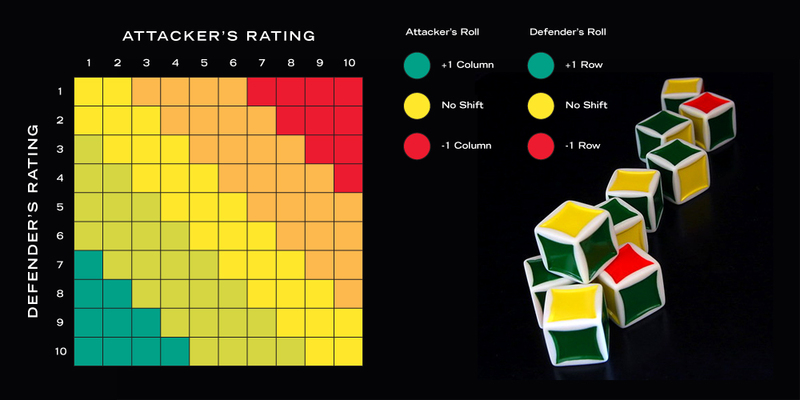 As far as I can tell/remember, each side (attacker and defender) was rated for some ability from 1-10. Those ratings were then compared on this chart to produce a "target" square. My thinking (based on looking at this chart) is that each side would then roll a number of the tri-color d3s (equal to their rating? ), and add the pluses and minuses (a la a Fudge-like mechanic) to produce a "final" square on the chart. The color on that square would then interpret the result (extreme miss, standard miss, barely a hit, standard hit, extreme hit?) based on the action. I'm happy to report the "Treasure and Traps" section of the d30 DM Companion is complete! 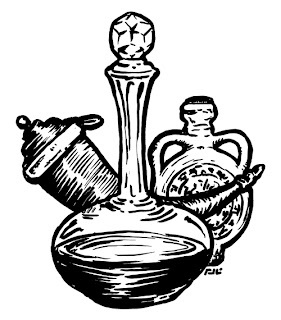 And, yes, the top of the decanter is a d30. Thanks for noticing. 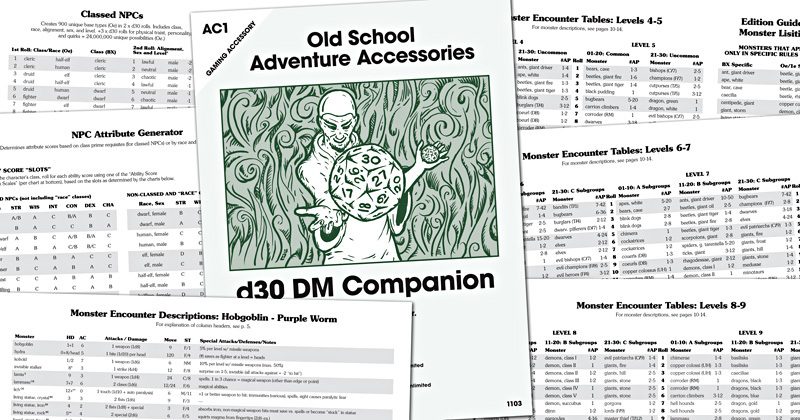 Right now, this is the back cover image for the d30 DM Companion, but I'm thinking about saving it in case I decide to do a wilderness/outdoor edition. Image ©2011, Richard Jean LeBlanc, Jr./New Big Dragon Games Unlimited. The reproduction or re-purposing of these images is strictly forbidden except by direct permission by the copyright holder. This image is NOT CREATIVE COMMONS! 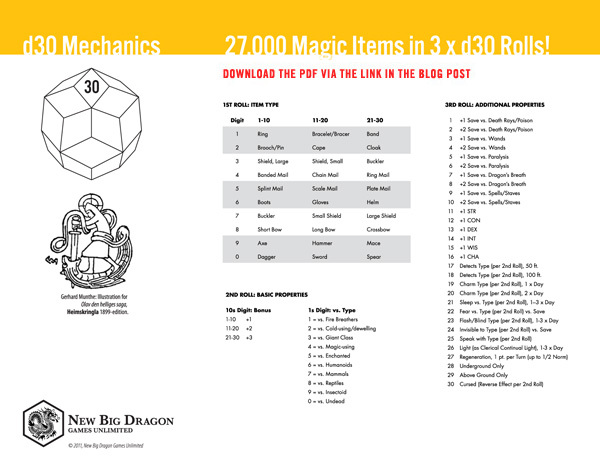 As I mentioned in my recent Starmasters playtest update, the two keys to the Starmasters mechanics are: 1) an "Action Table" that serves to resolve combat, skill challenges & contests, and saving throws, while seamlessly incorporating critical failures and outstanding successes (a mechanic I'm particularly proud of), and 2) an "Effects Scale Chart" used to handle any sort of "product" in the game, including weapon strength/damage, as well as the effects of skills used in the game (e.g., the effective quality of a forgery or a security system.) The idea being that the only thing otherwise required at the table would be a couple of stats for your skill, ability, or weapon, and you'd have everything you needed at the table. Well last night, with the help of a little Python program written by my co-conspirator David Welborn, I think we've managed to create a nice, evenly-balanced "Effects Scale Chart." Now, we've just got to start laying in some weapons against the various scales (e.g., "1dA, 2dA, 3dA, 1dB, et al.) so we can get back to the shooting and the blasting and the killing! RPG White Elephant Gift Exchange: Who Wants In? 2) Once the "enrollment" period has closed (maybe Tuesday, midnight CST? ), I will create two lists - A) a randomly assigned list of numbers that correspond to "wrapped" (hidden) gifts, and B) a separate random list of names for the draw order. 3) The name on the draw list chooses a number from the (blank) gift list, at which point I will list the "gift" next to the drawer's name and "cross out" the number from the list. 5) Drawing continues until all have gone, at which point I will reconcile the list, providing the original giver of each gift with the mailing information of the final recipient of their gift. It is up to each original gift giver to then mail that item to it's final destination. Since I'm proposing moderating this, I will present two options for my participation to be chosen by those who participate. I can either: A) throw a gift in too, but just take the last unchosen number (no stealing for me, wouldn't be fair) whatever it may be, or B) just moderate without participating. 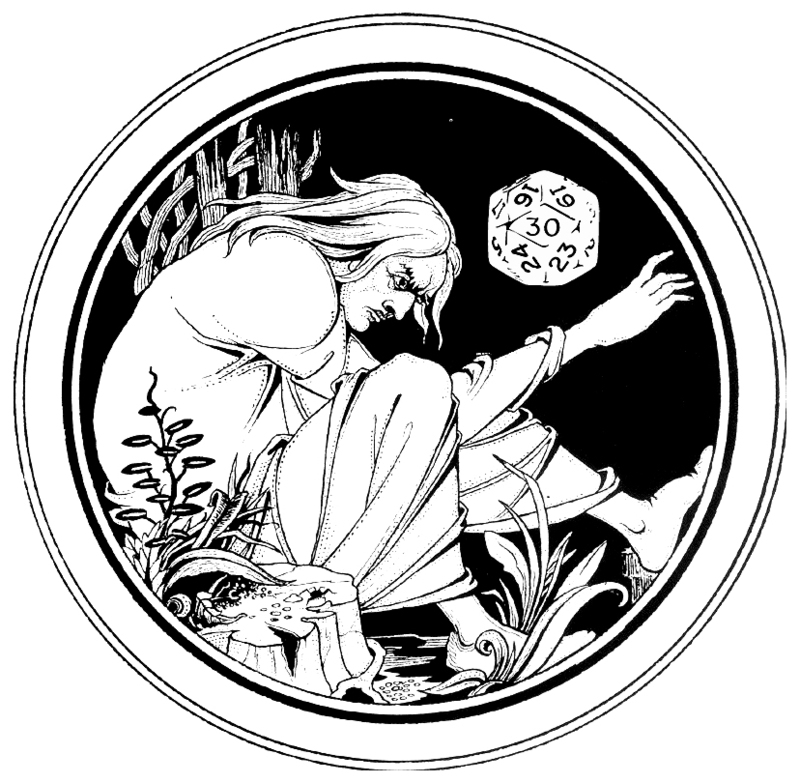 In my Really Old School Artist post from back in November, I discussed the work of John D. Batten and how I discovered Batten's work while trolling Wikimedia Commons to find images for use in the layout of The System. Such is also the case with the work of Willy Pogany. This week's d30 Feature is from the upcoming d30 DM Companion and features a quickie poison generator. 'Nuff said. 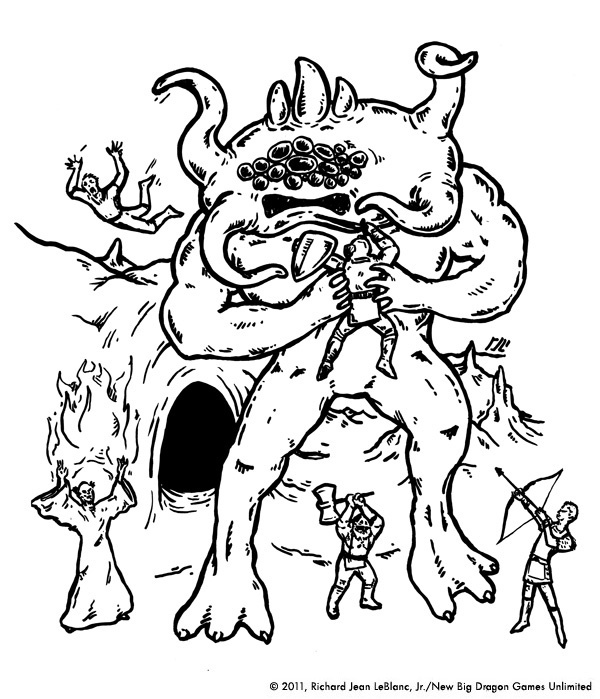 d30 DM Companion Update 2: Character and Monster Sections Done! Non-classed NPC Generator: 27,000 variants of Merchants, Traders & Misc. Monster Encounters Overview: includes a d30-based bell-curved chart for # App. I've already got the traps page done and a couple of pages of treasure, but have plans to continue to flesh this out with the goal being "as much depth and detail as possible in as few rolls as possible." Let's face it, when you're at the table and you need something quick, you need something quick. Am I right? We ran another great test of Starmasters combat last night and couldn't be more pleased. In some ways, the Starmasters combat system is really an extension/culmination of the original combat mechanics I wrote for The System back in 1985 and has acted as a catalyst for refining the current mechanic refinements to The System: Expanded. What it has produced is an elegant combat system that technically only requires two tables for the resolution of any action in the game: 1) an "Action Table" that serves to resolve combat, skill challenges & contests, and saving throws, while seamlessly incorporating critical failures and outstanding successes (a mechanic I'm particularly proud of), and 2) an "Effects Scale Chart" used to handle any sort of "product" in the game, including weapon strength/damage, as well as the effects of skills used in the game (e.g., the effective quality of a forgery or a security system.) Don't worry, old-schoolers, you still get to roll for damage; you just have to do it all with d6s. 1) The issues with the phasing (order and interval of actions) is resolved. 2) The system really seems to produce what you've come to expect in a "sci fi shoot out." 3) A little armor goes a long way. The scale for attributes (including HPs) in Starmasters is rather small (1-6) in comparison to most RPGs (e.g., 3-18). It is my belief that one good blaster shot or well-placed sword strike should kill a clumsy, unarmored character. 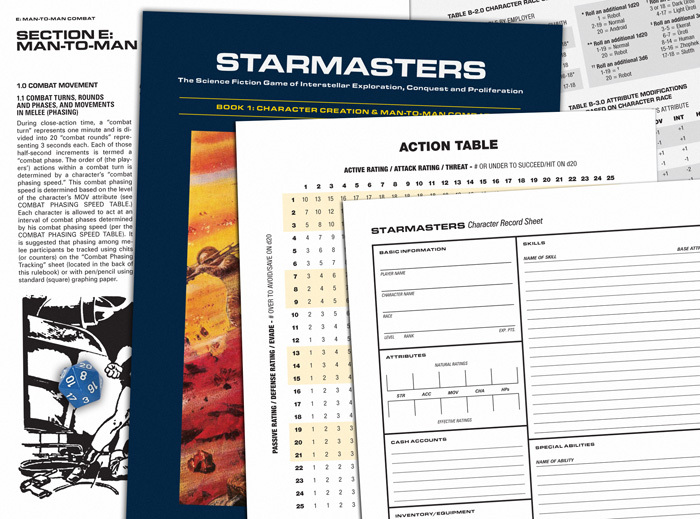 Also, Starmasters began as a 70s wargame concept, so the smaller scale was always in line with that idea. Those things being said, even a little bit of armor (just 1 or 2 points) went a long way in helping both "naturally" armored characters (like the Sluuth and the Zhophek), as well those wearing armor (like the Human) stay alive. These should be pretty simple to work through now that the other issues are resolved. I'm particularly interested to see how a well-armored character handles knockback, considering that a really good shot could create a lot of impact (force) without killing the character entirely. 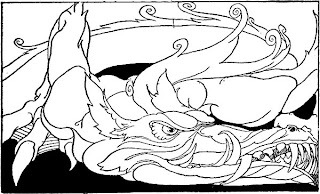 Stay tuned for our next episode, "The Landing Party," in which our faithful heroes take on the deadly Ekeni'qos Bloodbeast and the legendary Thuzzendahg! After a weekend (and 1 weekday) of tables and charts and text and tables and charts and text and table and (you get the idea)... it was nice to sit back and knock out the cover illustration. As I was working on my d30 DM Companion this weekend, I found myself having to deal with something that, while most of know they're there, may or may not use them much in the context of everyday game play. (I know I don't, but I could be an exception.) 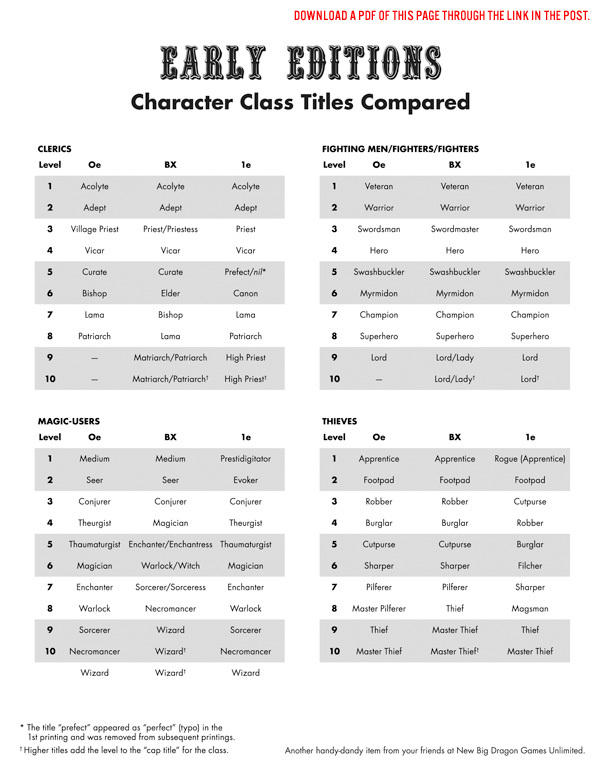 I'm talking about the character class titles by level from the early editions of THE game. 1) BX is the most overtly politically correct of all the original editions. Yes, we all knew it, but someone had to say it. Look at 1e's 8th level thief title... Magsman. Now, maybe that term is more familiar to some of you Brits out there (being a British slang term for a swindler), but the term obscure enough that its appeal is toward the more well-read. But why add it at all? I mean, it's not in Oe, so where did it come from? And why was it so important as to be added at all when the other thief titles in 1e were simply reordered from Oe. 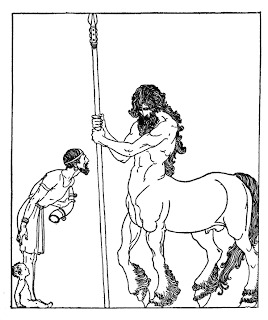 My guess is that Pilferer sounded a little "small" for a 7th level thief. Maybe it works for a 3rd or 4th level thief, but not 7th. What Magsman implies, on the other hand, is something more along the lines of a con man, which seems to be much more in line with a 7th level thief. 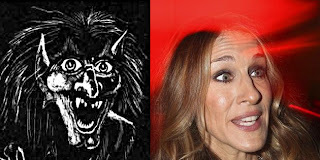 Another difference of note in the BX reworking is the dropping of the MU titles Theurgist and Thaumaturgist. This one's a no-brainer. Let's face it, of all of the class titles that ever graced the pages of the early editions, those two (along with Prestidigitator) are the least tongue-friendly. Especially if you're trying to introduce the game to grade-schoolers. 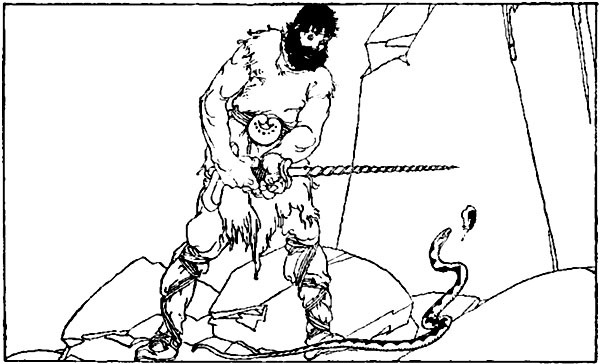 3) The fighting man seems to be either the most fully realized, least debated, or completely uninteresting character class to the various edition writers/editors. Apart from the Swordsman/Swordmaster adjustment in BX noted above, this is the only original character class where there is no alteration in the class titles by level... through all three editions! The other classes go through (at a minimum) multiple changes throughout (mostly the shifting up and down in levels of certain titles), but only the fighting man/fighter remains essentially unaltered. 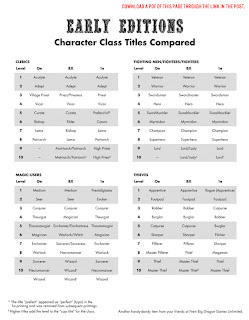 4) Of all the titles from all three editions (approximately 120), only one class title (1e's first level thief) has more than one class name. 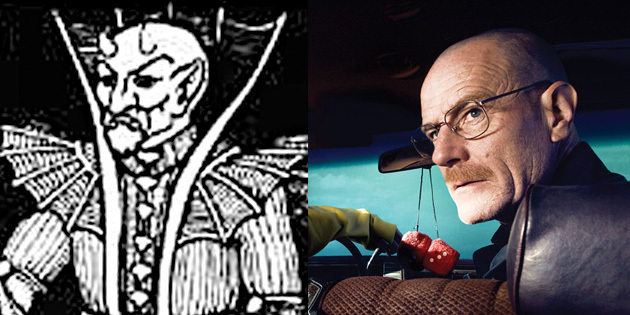 In the 1e PHB, the title of the first-level thief appears as "Rogue (Apprentice)," with the title Apprentice in parentheses. 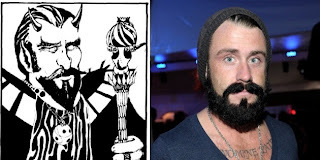 Given that thievery is a guild system profession, the choice of the title Apprentice seems obvious. But why was it not important/strong enough for 1e that Rogue become the main title for that level, and the title "Apprentice" relegated to secondary status? 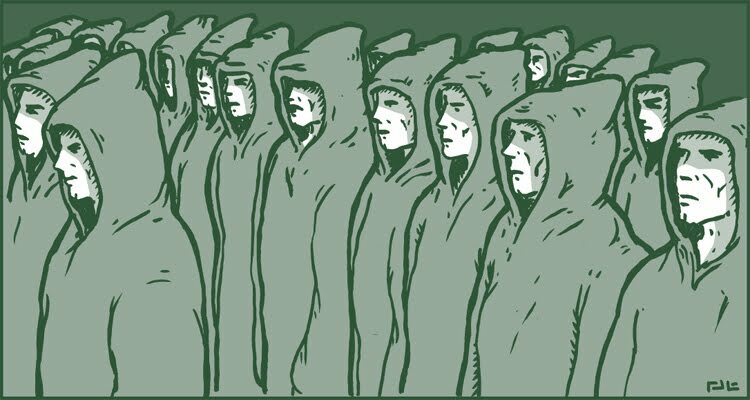 Was the Apprentice designation so ingrained with players, or so important to the guild idea, that the writers couldn't abandon it? I'm truly at a loss on this one since, by comparison, they generally changed, shifted, altered, removed, and added other titles (seemingly) at will. In the early printings of the PHB, the 5th level cleric title Prefect (obviously the intention) was printed as Perfect (a typo.) It was obviously easier/cheaper to take it out than to fix it. * In later printings** that class title was left blank rather than letting the word "Perfect" remain because it was wrong. Now that's irony, folks! * With a background in graphic design and print production, I can look at the page and pretty much guarantee you this was this case. In the "old days" (prior to the introduction of post-script in 1984), changing the title would have meant: 1) speccing a new piece of type (from a typewritten page), 2) having that type output from an old phototypesetter, 3) pasting that new piece of type onto the galley/mechanical board for the thief's page (assuming it still existed), 4) making a new sheet of negative film from that mechanical board (which would have taken 2 passes in front of the camera because of the gray bars in the tables), 5) stripping that new piece of film into a bigger sheet of existing film (if they still had it) for that printing signature (which would normally include 15 other pages to be printed together), from which 6) a new printing plate would be made to put on the press. If I had to guess what that would cost in early 1980s dollars, I'd guess somewhere in the neighborhood of one-to-two grand (including new charges for typesetting on down the line). 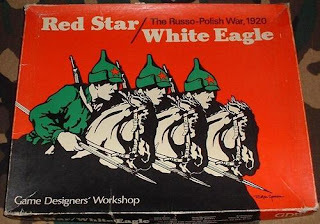 These days, printing plates for 1 color jobs are generally plastic and are made straight from the digital (computer) file. And they're beginning to get recycled. Back then, the printing plates (being rather expensive, made of metal, and somewhat damage resistant if packed well) were saved and shelved for reprints. 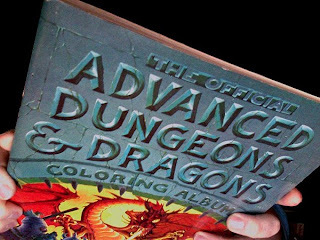 If you look at the PHB, you'll notice that the title in question is in a "white" area (as opposed to appearing on a gray background.) This is the kind of "fix" that could easily be done on the existing printing plate by "wiping away" (with a chemical) the word from the old plate (a change that cannot be reversed once made.) More so, it is NOT the kind of change that could have been made to the "gray" areas of that level/title table without creating a white hole in the graphic. Had the word "perfect" appeared in the gray area, I imagine we'd all have copies of the PHB with a typo in it. To download a PDF of the compared titles, click here. The Berserker and San Francisco Giants closer Brian Wilson. 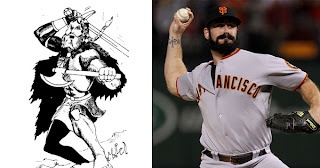 Asmodeus and (again) San Francisco Giants closer Brian Wilson. Dave Trampier's Goblin and comedian Dave Attell. 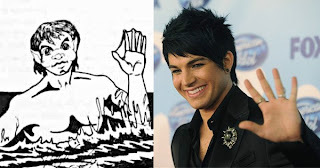 The Nixie and American Idol runner-up Adam Lambert. 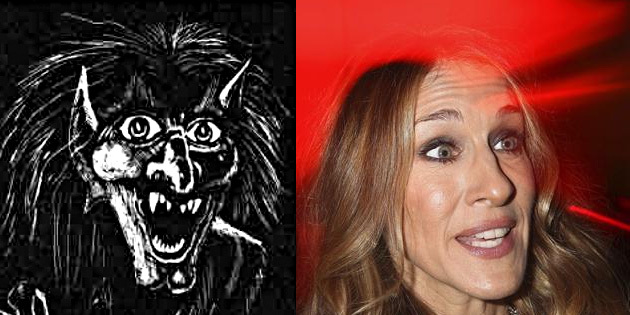 The Night Hag and Sarah Jessica Parker. In doing some recent YouTubing, I came across this clip from EWTN's "Tolkien's 'The Lord of the Rings:' A Catholic Worldview" portraying a debate between C.S. Lewis and J.R.R. 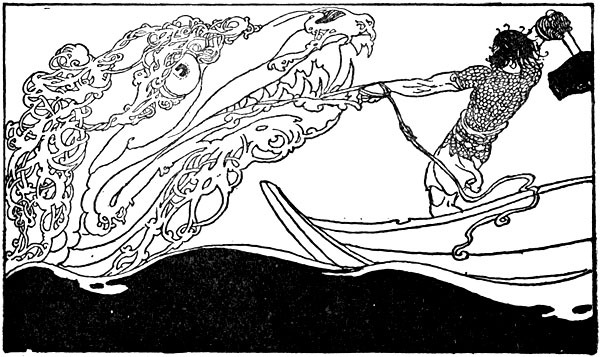 Tolkien on whether or not myths are lies. This debate was ultimately instrumental in C.S. Lewis's conversion to Christianity. 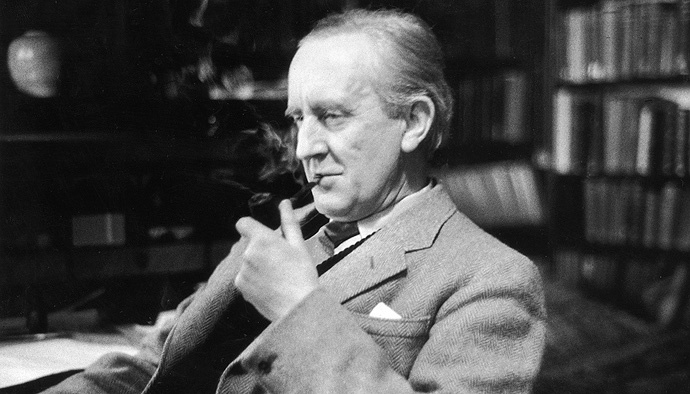 Tolkien, a devout Roman Catholic, filtered a Catholic worldview into LotR, mostly during the writing of his second draft. This is not always obvious on a literal level (e.g., there is no mention of any sort of "god," much less a one true God in LotR). 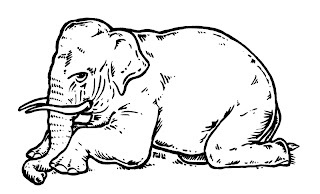 But, then again, sometimes it is (e.g., the Elvin Lembas bread that keeps its eater full for days). 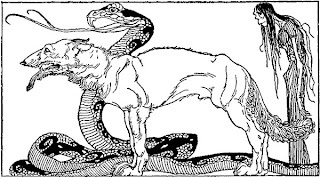 Moreso, the significance and symbolism of Catholic beliefs are woven throughout the characters and storylines, and are quite obvious from a meta view. For deeper list of relevant resources, please visit The Catholic Imagination of JRR Tolkien page. A Holy Grail of RPG Collecting? The review that seems to sum it best for me, though, is from dungeonskull who states that it just might be "the best encapsulation of an 'old school' D&D adventure ever made." Well, let's see... 1) old EGG wrote it himself, 2) there's a quest for loot with no other heroic motive (like rescuing or saving); 3) it features a "well-rounded" adventuring party (fighting man, cleric, thief, magic-user, ranger, dwarf, elf... you get the idea); and 4) it's got classic D&D monsters like a bulette, a lich, a beholder, an umber hulk, a remhoraz, and Tiamat the dragon. Yup. That pretty much sums it up. Now I know how Jared feels when he finds a safe in the back of a locker on Storage Wars. Any of you who played Jeff Dee & Jack Herman's Villains & Vigilantes "back in the day" probably have some of the same fond recollections of the game that I do. First, the FGU ads for V&V in Dragon magazine were all it took for me to say to myself, "I want to own that game." Second, I thought it was pretty decent of FGU to include the game master's screen in the box (Revised Edition, 1982) rather than try to sucker me out of another 5 or 10 bucks later (even if it was in B&W white on a pretty cheap uncoated card stock.) And third, it included the "Laws of the Land," (section 5.5 A), a pretty standard criminal code that helped a high schooler wrap his head around concepts like "criminally negligent homicide" and the differences between first- and second-degree kidnapping. So what has me reminiscing about learning criminal codes 5+ years before Law & Order started its 20-year run? I have jury duty today. I don't know what it is about me, but I seem to be a magnet for jury duty. No sooner is my ineligibility period over when my next jury summons arrives in the mail. C'mon, man... FUNK DAT! Hopefully I won't have to spend too much time in voir dire, which should leave me free most of the morning to concentrate on additional engines, tables, etc. for my d30 DM Companion. 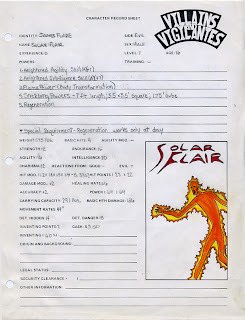 Oh, and in the picture above (a scan of one of my old character sheets that's been in my V&V box since 1985/6)... I don't remember if the character's name was supposed to be an intentional pun, or if it was just a typo. Image ©2011, Richard Jean LeBlanc, Jr./New Big Dragon Games Unlimited. The reproduction or re-purposing of these images is strictly forbidden except by direct permission by the copyright holder. These images are NOT CREATIVE COMMONS! 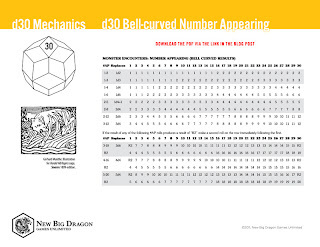 It seems I'm well underway toward having the d30 DM companion ready in the next couple of weeks! This is no mere compilation of a bunch of numbered (1-30) lists of conditional encounters. 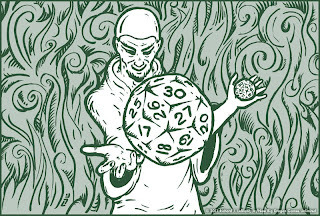 These are, in most cases, either 1) true "engines" for creating as much variety as possible in as few rolls as possible, or 2) d30-based mechanics to SIMPLIFY AND SUPPORT the role of the DM/GM. So far, this section only includes outdoor encounters with humanoid remains (900) and markers and signs (30). But those two (combined) take up less than half of a page! Next update to come next weekend. Ran my first Skype combat playtest last night with my co-conspirator Dave Welborn. I have to say I was pleasantly surprised, both the refinements in the system AND the moderately seamless play via that fancy interweb thang. 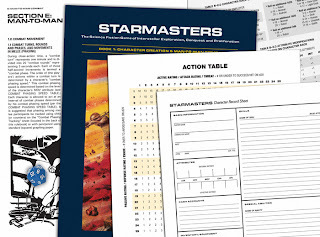 Unlike the more nebulous "loose action" (role-playing intensive) aspects of gaming, Starmasters combat benefits greatly from being able to visually track 1) movement, facing and distance on a hex map, and 2) initiative/action turns (moderated in "phases," per the image at the top of this post.) Screen sharing worked well enough, though I was on the sending end; Dave would have probably preferred a bit more resolution in the image. We did seem to resolve the off-target issue for "area of effect" weapons. We used a mechanic similar to Starmasters' "range indexing" (in which a character's ACC affects his overall range with a fired weapon, scaling distance penalties to the character's ACC); Dave had already come up with this mechanic as of last playtest, but this round proved it in practice. We need to refine the added mechanic for fumbling/stumbling (if a character tries to do too much in one phase.) The mechanic is good; the method for determining odds needs to be tweaked. Too many characters dropped their weapons too often. Next up... moving from the "every man for himself" free-for-all, and moving to a "team vs. creature" mode. The plan is to arm and armor the team heavily, but put them up against some nasty alien creatures. I can't wait!!! 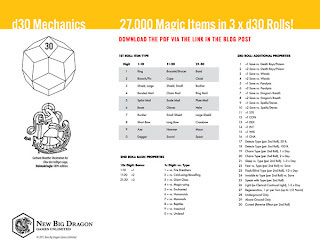 27,000 Different Magic Items in 3 Die Rolls! I've tried to structure the charting to provide as much theme development as possible, while still trying to offer some variety. I didn't want to just randomly assign different properties so that you have a schizophrenic magic item whose origins would be hard to ascertain. So two disclaimers: 1) the items are limited (in these charts) to weapons and armor, and 2) the chart is a little open to interpretation (which I believe these kinds of charts should be.) As an example to the point of interpretation above, during roll 2 (in which the type is chosen), the categories are a bit general (e.g., "humanoid" and "fire-breathers.") My suggestion is, once a GM has discerned all the properties, he/she should feel free to refine them based on the other properties. You can see how that item as a nice overall theme going for it. And completely random. Now, just fill it in a with some sort of appropriate name (like Draconian Armor of Warmth) and you've got yourself a moderately unique magic item. First off, I swear, the headband that provides +1 WIS was totally random! Now, the +3 vs. (all) humanoids is a little strong, so let's go with just orcs, and customize a bit so the WIS bonus is only given to clerics... Voilà! 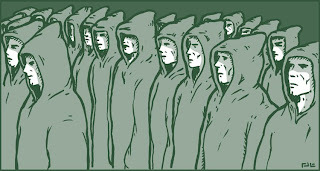 An clerical band of protection from orcs. NOTE: This set produced the following rolls: 17, 13, 18. I think that because these numbers were so close together, it becomes a strong test of whether these tables work or not. So let's take a look, shall we? I'm seeing this as a Dwarven shield of giant protection. Now, I'm not saying all of the results will make complete sense. For example, if Roll Set C (above) had produced a 3rd roll of 14, the shield would have granted it's bearer a +1 INT bonus. At first glance, I'm not sure if that makes complete sense or not. We need to put those properties in the right context... so... given that the shield is small, and INT is a prime req. for thieves, which is a typical class for halflings, maybe under those circumstances it becomes a halfling shield of giant protection. Okay. I'm thinking this works pretty well. Like most humans, Crane had no memory of her first birthday. Nor her second. Nor her third. Neither did she have any recollection of Terran Unification Day, though she was five at the time, and her grandmother made 1,000 cookies in honor of The One Thousand, and the entire floor of their domo tower smelled like perlant chips for a week. These are the kinds of things that most humans remember. But Crane wasn't most humans. 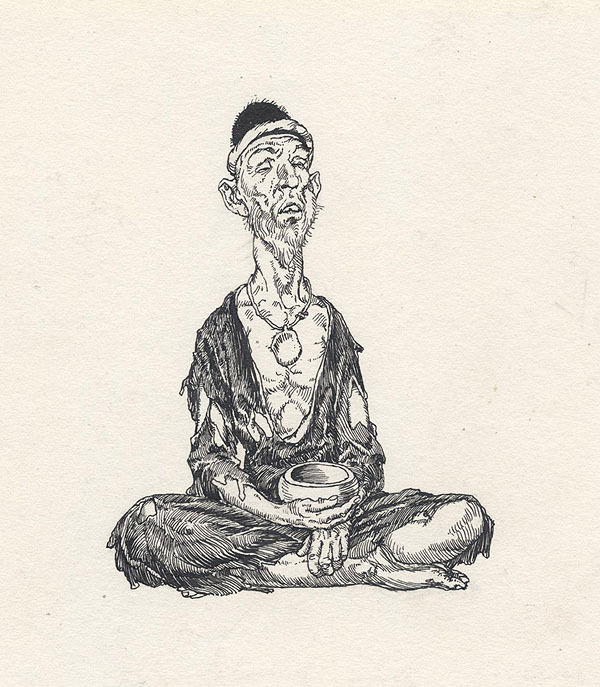 Crane's first memory, as clear as any crisp deciduous morning, was of the porcelain fingernail at the tip her left index finger stroking a thin line up that warm shaft, the sweet smell of the afterflux seeping from the chamber and up to her thin, oval nostrils, and crawling it's way up her nasal passages and burring itself deep into her hippocampus like a hungered Thuzzendahg. 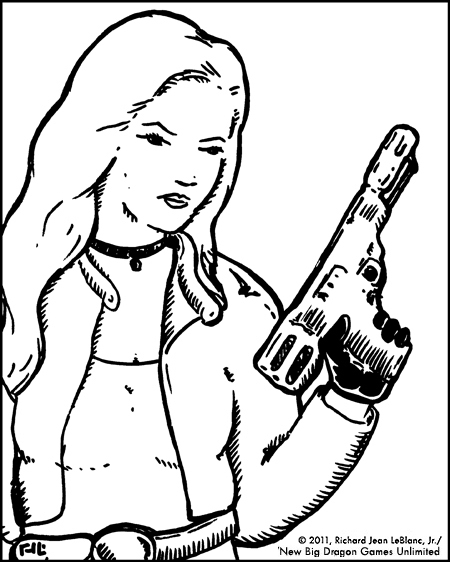 After all, it's not every day a girl fires her first Stermer blaster. She'd come by it honestly. It had been her father's before he died liberating the Ekerats on what is now New Callisto. And it had been his father's before he granted it to Darmon Jr., Crane's Father, on the day he enlisted in the Terran Exploration Corps. It was Crane's mother's wish that Crane never find it but, as these things go, fate trumps desire every time. It was fate that brought that blaster home with the remains of Crane's father and put it in the hands of Crane's mother, Ophelia. And it was fate that brought Crane to live with her grandmother when Ophelia died from a blood parasite. And it was fate that drove Crane deep into the far corner of her grandmother's closet where she found the burled Fellwood box, engraved with her great, great, grandfather's initials, and heard the voice of destiny calling to her from inside.